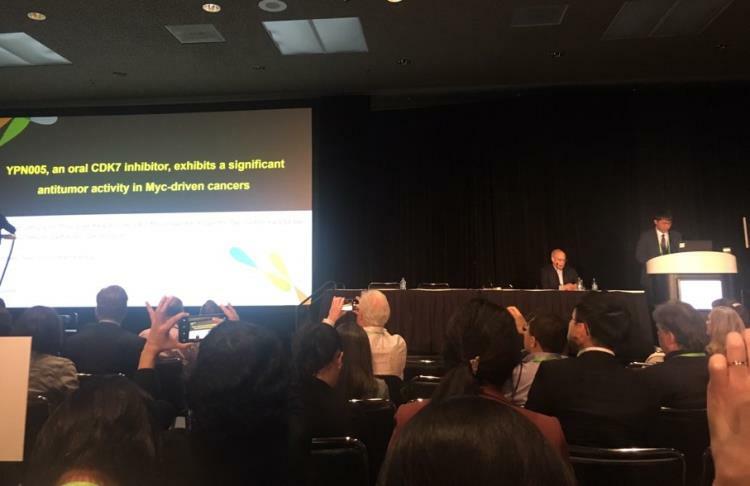 Yungjin Pharm exhibited the result of YPN-005 (CDK7 inhibitor) for "the development of target therapy for Myc -overexpressed tumor cell" at the American Association for Cancer Research (AACR 2019) held in Atlanta, USA. The American Association for Cancer Society (AACR) is the most authoritative society in the field of cancer research, attended by about 22,500 researchers in the world, where various researchers gather to discuss and discuss their findings. Yungjin Pharm was intended to present the poster at the conference, but the organization was attracted by its development strategy of the target cancer drug YPN-005 (CDK7 inhibitor) based on the c-Myc biomarker, so invited to the oral presentation session on April 1st. In this study, YPN-005 (CDK7 inhibitor) showed to inhibit the growth of cancer cells, which presents the inhibition of key cancer genes expression, such as c-Myc and MCL1, by inhibition of RNA polymerase II phosphorylation. In addition, the down-regulation of PD-L1 and CD47, the immune checkpoints, was reported through inhibition of the expression of c-Myc oncogene in cancer cells. This project was recently selected as a project to develop a targeted anti-cancer drug, YPN-005 (CDK7 inhibitor, from the KDDF, and currently YPN-005 is in the process of selection of the lead compound entering preclinical toxicity test in the second half.